Posted August 1, 2014 by Heather Michet & filed under Food, Food As Medicine, Medicinal Plants. Happy berry season! I’m just back from picking more than 5 lbs. 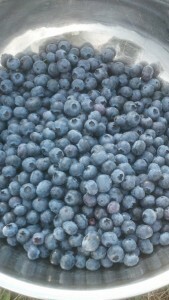 of blueberries at my local patch and what a crop! 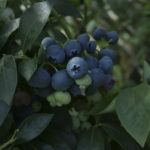 The bushes are loaded with large, perfectly ripe and ready-to-eat globes of purpley-blue bliss. This is the most abundance I’ve seen in this field throughout the 5 years I’ve been picking there. It’s fun! It takes me back to my first food related job: picking berries with my cousins. Memories and stories galore from those years, not to mention the experience of working for a crew boss! I am supporting a local farmer, my community and ‘voting’ for sustainability with my purchase. The planet benefits: no food transport costs or packaging. Being outside gathering Mother Earth’s bounty reinforces living in rhythm with the seasons and partaking in what is provided for my sustenance right where I live. Polyphenols protect the brain from inflammation & oxidative stress which may, in turn, defend against degenerative effects from aging, stroke and Alzheimer’s & Parkinson’s disease. Are you ready to feel in sync with your life and body, kick out a progressing condition or return to vibrant health? My passion and specialty is creating your Vibrant Health plan using natural solutions that help you get well and stay well. Have a look at my Treatment Packages, see which one fits for you and let’s get started. Your season of vibrant health begins now. Blueberries are one of my breakfast staples. Blueberries, soymilk, almond meal and chia seeds blended in a smoothie. I am good to go all morning. Quick, easy and fills me full of good things that are good tasting. Nice smoothie recipe, Tory! Thank you for sharing it. Blueberries, my all-time favorite fruit. It’s a nice change to love food that loves you right back.